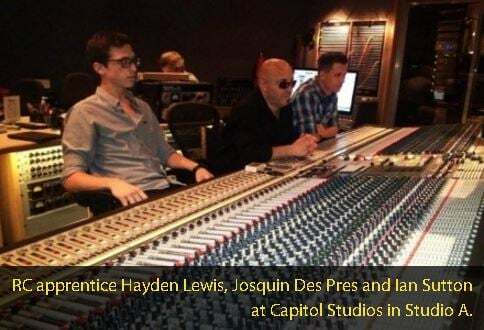 Producer, engineer and songwriter Josquin des Pres, has had a lengthy and illustrious career stateside. He’s worked with Bernie Taupin, Elton John’s lyricist, and produced for Jack Johnson, Tech N9ne, The Gipsy Kings, Slightly Stoopid, Carly Smithson, and Ricky Skaggs. He’s also composed for more than 40 TV shows and films. Prior to that, Josquin was an in-demand bass player, playing with some of the biggest acts in France, from which he hails, originally. And the work hasn’t ceased. Josquin des Pres records, produces, mixes and masters for an array of world-renowned artists and also works doing audio for film and television. Track Star Studios does all the music for MTV’s Catfish, Pimp My Ride, Cribs and Teen Mom. Many of Josquin’s apprentices get to work on these shows and earn real, professional credits they can add to their resume or CV. Labels and broadcasting companies are in the mix too, including Clear Channel Broadcasting, Virgin Records, Warner Bros and Slash Records to name just a few. And when it comes to hiring, Josquin turns to his apprentices and Recording Connection’s pool of talent, knowing they’ll have the skills and workplace familiarity it takes. Former Recording Connection apprentices who work with Josquin include: Phil Higgins who worked with Josquin for years and ultimately went on to found his own studio in Nashville (he and Josquin still team up on projects); Thomas Burdett, who took over when Phil moved to Nashville; Tim Schumann who does recording and tracking; Hayden Lewis, also for recording and tracking; and Aaron Castro for electronic and dance track programming. Read our full interview with Josquin here.